Since this is my first post here, I thought I'd throw in a bit of background to go along with the minis. I'm a long time d20 player, but my group has never been that big on minis. Late last year, as our party was out dungeon crawling and our repurposed Heroscape figures (and Captain America) were busy killing little red plastic tokens, I decided that we could do a little better. 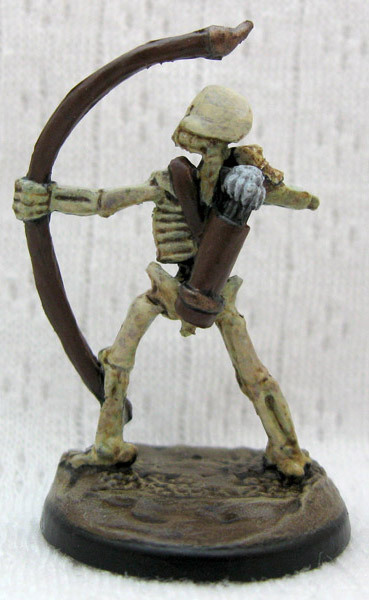 Of course I had never painted before, and I was realistic enough to realize that I would need to destroy a few minis as part of the learning curve, so I went on a search for cheap minis and discovered Bones! After slapping some paint on a few I decided to get some feedback, but it turns out there is a bit of an art to this photography thing too (Who knew, right?). 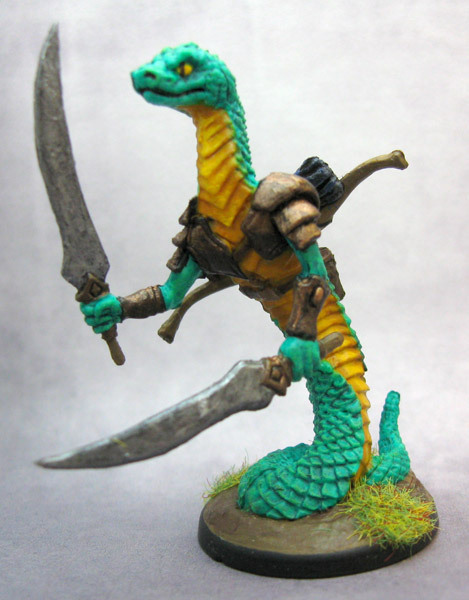 The first round of pics were not very representative of what the mini's looked like, so I sat the camera aside to paint a few more minis and then figure out how that take pics. 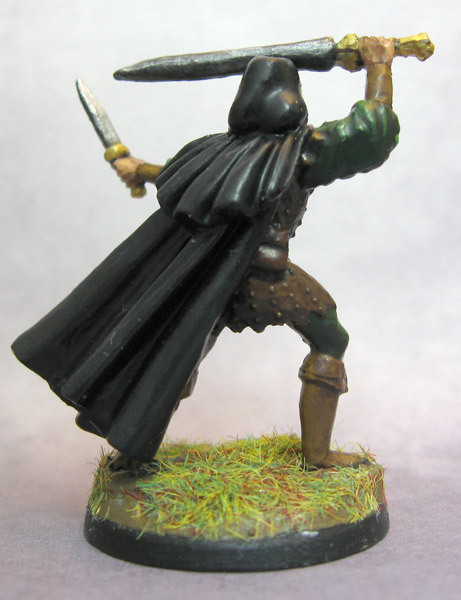 But then I painted a few more, and then a few more, and suddenly I had fistfulls of minis and no feedback. So the other night I sat down to figure out how to get halfway decent pics, and then last night I downloaded a few free backgrounds as well. To start I'll have a mix of images with old rag vs. printed backgrounds, but going forward my photography skill should improve as well. Anyway, on to mini wave #1! These were all painted late last year and are all minis that I either didn't care about or had duplicates of. Also, I decided that I wasn't going to drive myself crazy removing mold lines on minis that weren't going to look that good anyway, so I just knocked off the worst of it. Thanks for looking, and they do get better. If those are first attempts you've got nothing to worry about. They are very nice. Heck of a lot better than red plastic tokens, and nothing to be ashamed of on the table. Definitely better than red plastic tokens. 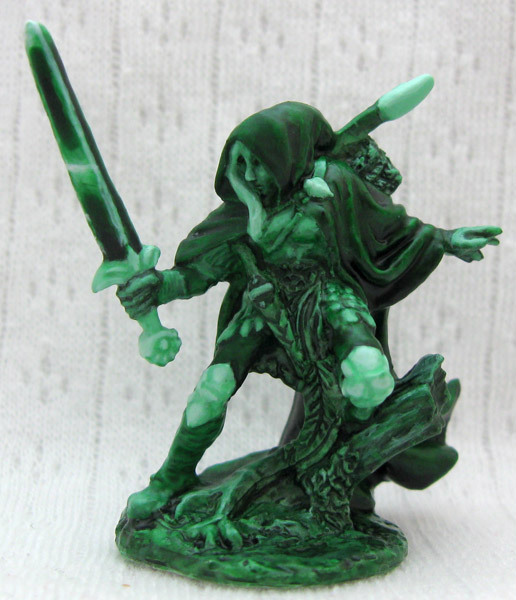 I think you have great tabletop figures! These are certainly well done for a set of first attempts. These aren't bad at all! I suppose it all comes down to what you want to achieve. I will say that this is an awesome place to learn and a great community to get feedback from. It's great to have access to so many talented people who are generous with their knowledge. 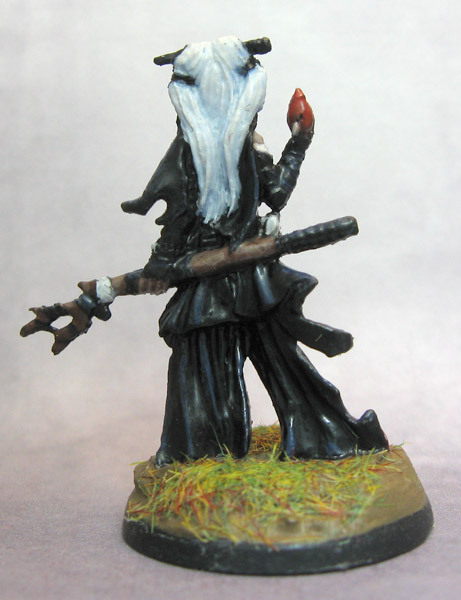 It seems that many of us started by working through the Reaper Learn To Paint kits (I still have one to work through... ahem!) They'll definitely add to that great work you already have going on. 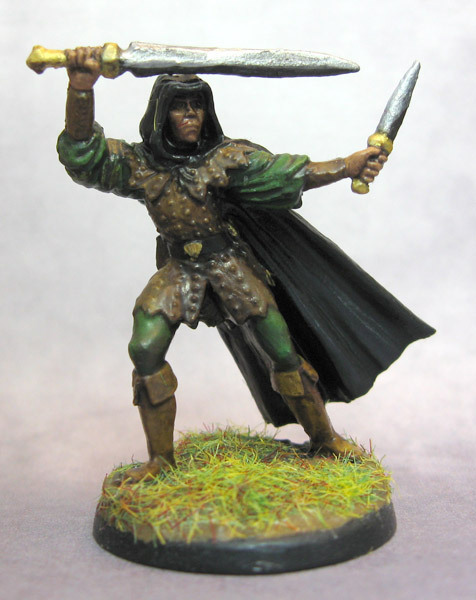 In fact, it looks like you've probably already painted more figures than I have, and I started last November. Like I said, it's all in what you wish to achieve. Some, like myself, don't game, and simply paint for pleasure and to see how good of a painting/basing/professional look we can get. 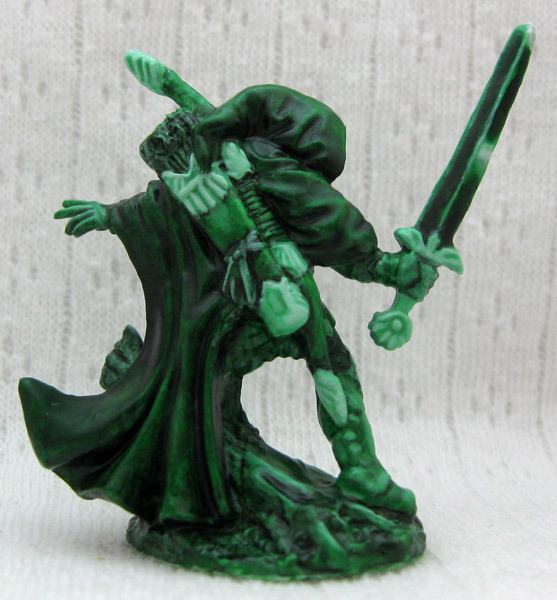 Others paint large numbers of miniatures for tabletop, and thus aren't as concerned with the level of detail. Take a look around, look at WIP's (Work In Progress) usually located under these posts in red, and you'll definitely pick up skill and ideas. Welcome to the great, fascinating, and sometimes frustrating (RUFFLES!!!) world of miniatures! What Kharsin said...it's a good community here with great support and insight. Oh and ask as many questions as you can. Welcome to the board and the zany world of watching pain dry! 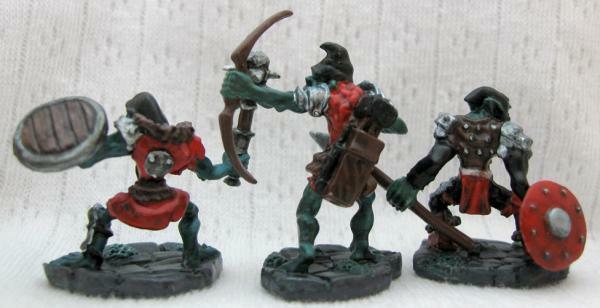 Those are great tabletop minis, I would not be ashamed to have those on my gaming table. Very clean execution. Great start. Nothing to be ashamed of here. Like the scarabs and hellhound. Looking forward to the rest. 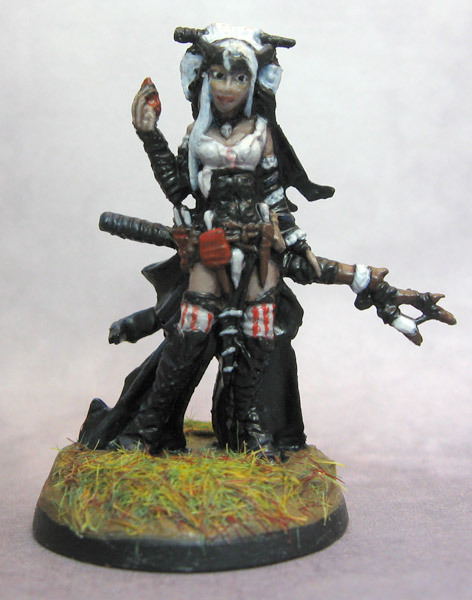 Welcome to mini-painting and the forums! WELCOME ABOARD! You are a natural; some shading & highlights with a bit of detailing are all that you need to do...they'll come along with practice. GREAT START! 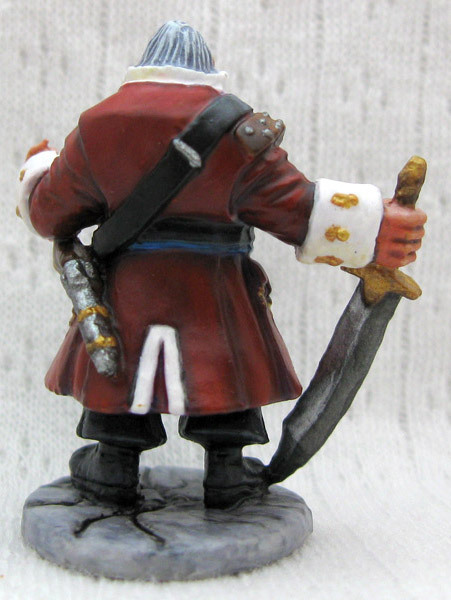 Tip #1: don't be intimidated by the minis; there is virtually nothing you can do paint-wise that can't be corrected. With a quick Simple Green soak & brush you've got a good-as-new mini to try it again. Thanks everyone! I've been looking around the forum, and I'll be sure to pick your brains when the time comes. 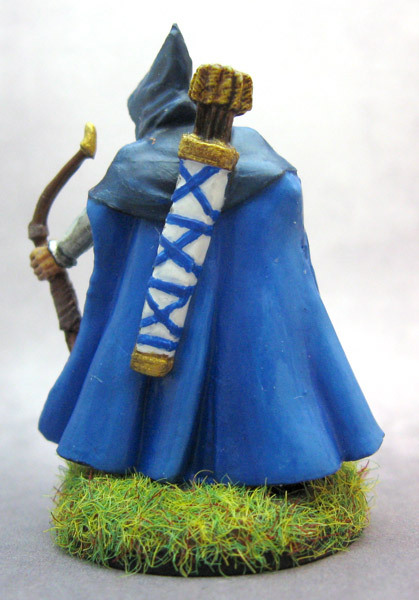 Here's the next round of minis, taking my painting experience into January IIRC. These were mostly an exercise in drybrushing and some very simple basing. 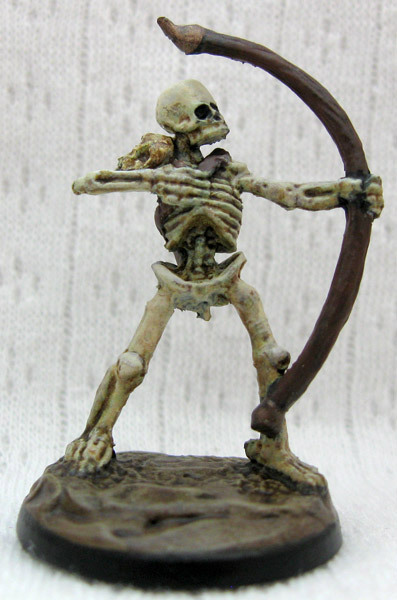 Skeletal Archer - Just a simple mud base. I'm not really a fan of the missing jaw. 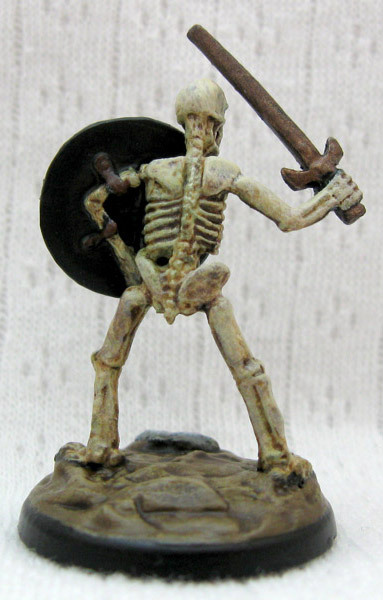 Skeletal Swordsman - This guy was special; he got a rock. 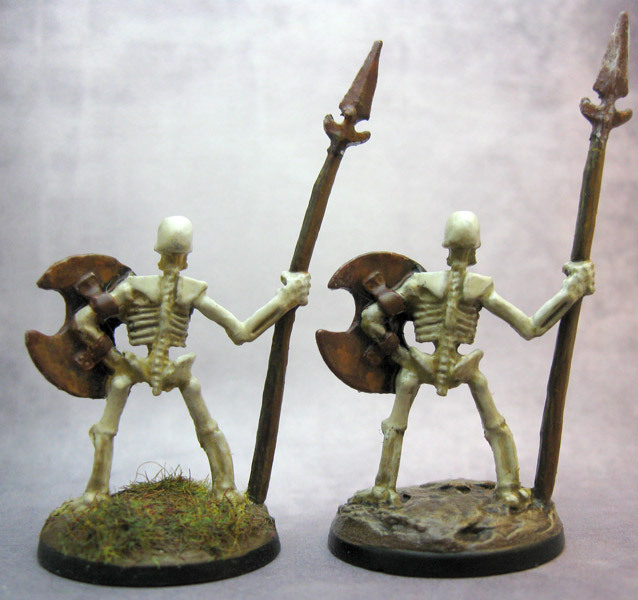 Skeletal Spearmen - I've read the arguments on priming black vs. priming white, so I decided to give it a try myself. Can you tell which is which? Also, I started my experimentation with grass. 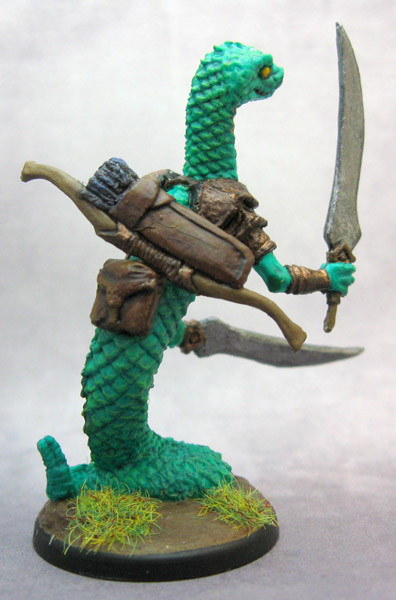 The Army Painter field grass that I picked up seemed a little to vibrant for a skeleton though, so I tried painting it too. Viewed from above, the grass does look somewhat dead but it doesn't appear much paint made it onto the sides of the grass. While I was at it, I also tried making the metal rusty as well. Seen side by side though, these guys do illustrate one of my frustrations with bones. They both had bent spears and both got the same hot water/ice bath treatment. One spear stayed straight, the other has slowly bent back while just sitting for a few months. Rats - Cute little rats, barely a threat to a 1st level party. Goblins take II - I used a completely different set of paint on these guys than on the last group. Not only did I want their clothing to look different for ease of tracking on the table, I wanted their skin to be more vibrant as well. 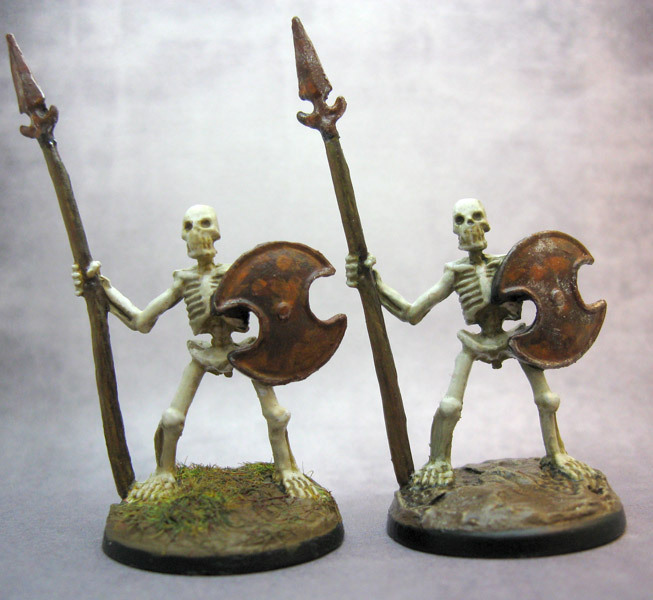 RE: the skeletons--I'm not a fan of the skull on the archers either; I hacked 'em off and glued on some replacements. I'm pretty sure the left hand spearman is the white primered one. re: Skeletons: Left one is primered white. 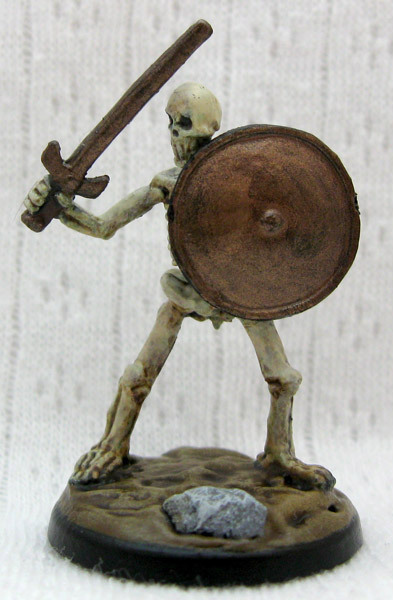 The shield and light tones for the bones are what makes me think this. The one on the right's shield is a little more vibrant, for a rusty old thing, which tends to be a hallmark of priming black (let alone the recesses are really dark). Again, good work, keep it up and you'll be an expert soon! All right, this will be my last post of any substance for a few days; if you've never worked 48hrs over a weekend, it leaves little time for painting. But to continue from last time, more experimenting with grass! I did know enough to seal them before adding the grass, so any blades of grass that you see on them are easily removable. Arthrand Nightblade - How much grass can a person fit on a base, and what will it look like? Don't think I'll go that far again. He was also an experiment on shading white with blue and blue by mixing in white. I also wanted his face to look like it was in deep shadows, which is why it is darker than the hands. 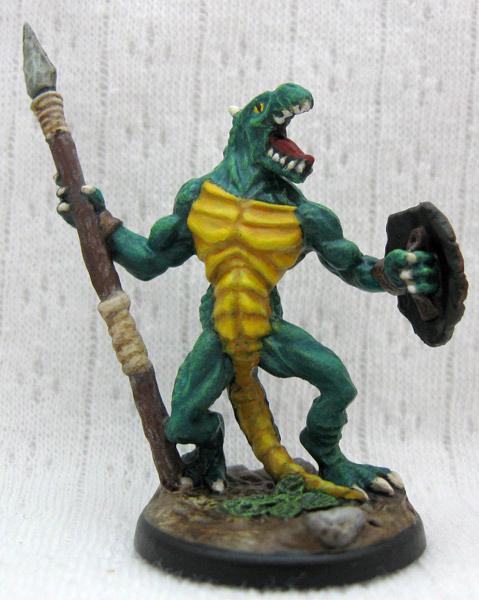 Lizardman Warrior - Ok, so this guy didn't get any grass, but he was painted over the same time period and gets posted with the others. 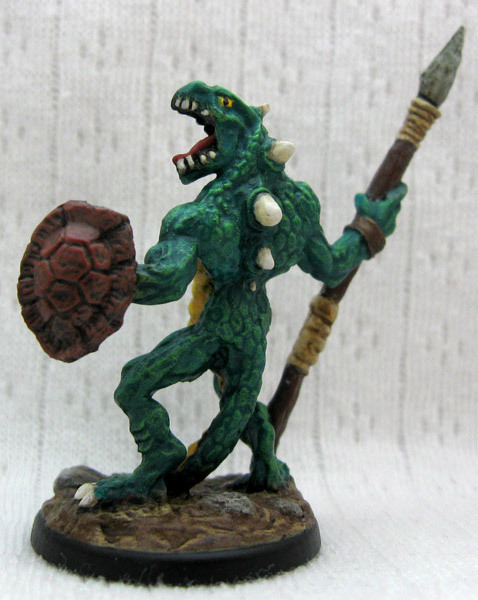 I kinda like this sculpt, so if I ever need a lizardman army I might pick up a few more of him. Also of note, if you've made it this far, is that he and the snakeman both used the same pallet for their scales. The difference? Prime black vs. directly on the bones. Hey, you're off to a great start. You're making better progress through your minions than I have. I've got the rats and the kobolds done. 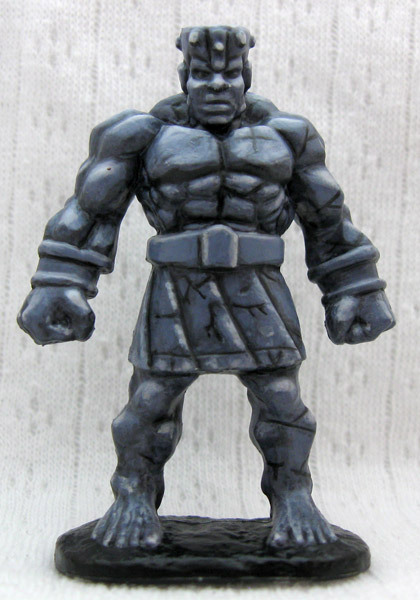 Orcs are next for me, I picked up the Orcpocalypse pack, so I have a few to go. I hope everyone survived the weekend. If you are reading this, I will assume that you did. 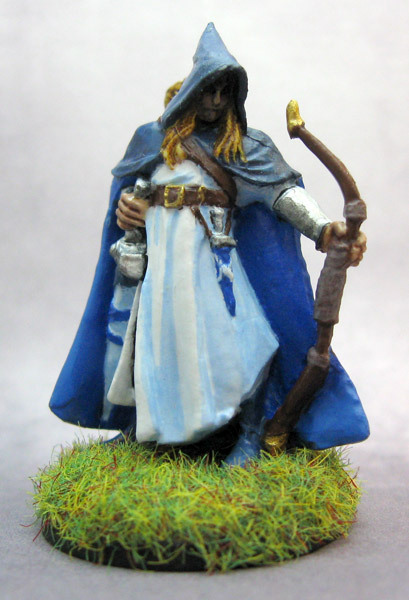 Nienna the Ranger was a first attempt at doing a monochromatic piece. It was a fun little exercise, and at some point in the future I'll sacrifice a few bones in order to try it with other colors. 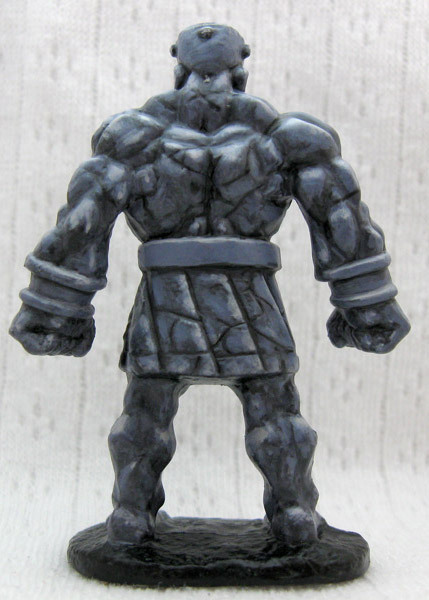 The Stone Golem was originally supposed to look like rock, but somewhere along the way became an achromatic piece. At some point I plan to pick up some larger bases and do a proper job basing him, which is why his manufactured base has barely been touched. Vermin Spider Swarm. Not a lot of effort went into this one, though I did do something other than brown on a few just for variety. 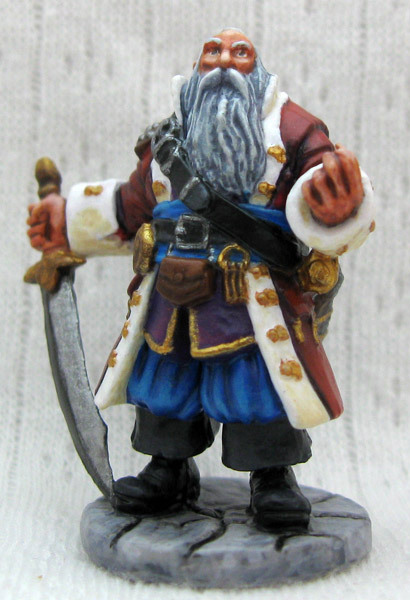 Old Barnabus Frost turned out as he did because I had heard that red was a difficult color to paint and I wanted to give it a proper try. I also tried shading white, but it ended up looking like a coffee stain. Well, all coffee drinkers end up with one or two eventually.